A NASA spacecraft zooming through the solar system firedup its rocket thrusters this week to fine-tune its approach to a bruised comet. The Stardustspacecraft fired its thrusters Wednesday to tweak its planned 2011arrival at the Comet Tempel 1. The probe delayed its arrival by just over eighthours, but that change maximizes the chances that the spacecraft will be ableto catch the best views of the comet, mission managers said. Comet Tempel 1 is a familiar one for NASA. The spaceagency intentionally slammed its DeepImpact probe into the icy wanderer in 2005 just to seewhat it was made of. But Stardust has less violent plans ahead. Stardust is slated to swing by Comet Tempel 1 on Feb. 14,2011 (Valentine’s Day), just under a year from now, to see how it haschanged since the Deep Impact mission. It will be the first time a comet hasbeen revisited by spacecraft from Earth. Stardust’smission was originally aimed at collecting samples of adifferent comet, called Wild 2 (pronounced “Vilt 2”). Itsuccessfully made that rendezvous in 2004 and sent its sample canistercontaining the comet bits back to Earth in 2006. Since then, Stardust has been hurtling through the solarsystem. 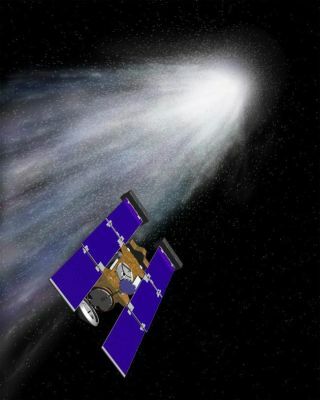 NASA recycledthe spacecraft to point it toward Comet Tempel 1 in 2007,which began the new Stardust- NExT (New Exploration of Tempel) mission. Stardust fired its engines for nearly 23 minutes duringWednesday’s maneuver while flying on the opposite side of the solar sideof the solar system from Earth. It launched in 1999 and is currently sailingoutside the orbit of Mars. "We could not have asked for a better result from aburn with even a brand-new spacecraft," said Tim Larson, project manager forStardust-NExT at NASA's Jet Propulsion Laboratory, Pasadena, Calif. , in astatement. "This bird has already logged one comet flyby, one Earth returnof the first samples ever collected from deep space, over 4,000 days of flightand approximately 5.4 billion kilometers (3.4 billion miles) sincelaunch." Stardust’s brief engine maneuver is a bit of cosmicinsurance for NASA scientists. It slowed the probe’s flight speed byabout 54mph (87 kph). By performing the engine burn, Stardust altered its trajectory toward CometTempel 1. The change should maximize the chance that parts of the comet seenduring the Deep Impact mission will be bathed in sunlight when Stardust swingsby to snap new comet photos with its high-resolution camera. In addition to the new cometphotos, Stardust is expected to record the composition,distribution and flux of dust in the coma – or head – of CometTempel 1. Scientists hope the mission will unlock a treasure trove of newinsights into how similar comets formed 4.6 billion years ago. "Stardust-NExTwill provide scientists the first opportunity to see the surface changes on acomet between successive visits into the inner solar system," said JoeVeverka, principal investigator of Stardust-NExT from Cornell University inIthaca, N.Y. "We have theories galore on how each close pass to the suncauses changes to a comet. Stardust-NExT should give some teeth to some ofthese theories, and take a bite out of others."